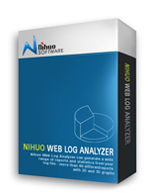 Download Nihuo Web Log Analyzer now, use it for free for up to 30 days, and start enjoying the benefits of knowing how prospects are using your web site. The trial version can run as the Standard, Professional and Enterprise Edition. Product documentation is included in the product download and the documentation is the same for all editions. We provide an activation code to licensed users that converts the trial version to the registered version. Please choose the operating system you are using and click the download link next to it.